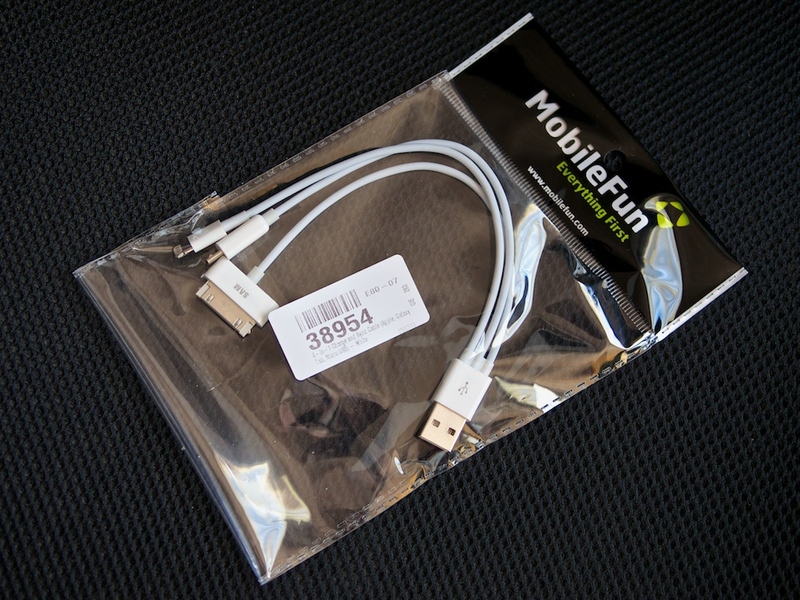 MicroUSB for various Android devices, digital cameras etc. The clever thing is, the Apple 30-pin dock connector also works with Samsung Galaxy Tab. Just flip the pin around and it’ll fit comfortable inside the Samsung Galaxy Tab, allowing you to sync and charge it. For this review, I used a 4-in-1 cable priced at £9.99 from Lovecases.co.uk, where you can find everything you need in terms of camera cases, cables etc. The cable is not original, but that doesn’t really matter, it works just as well as original cables, in my opinion. It looks original and it almost feels original, only if you look and feel carefully, you can see that it’s not an original cable, so my bet is that most people will not really notice it, or care about it. The cable is going to work just fine anyway. And works fine, that’s exactly what it does. I have it connected to a USB wall charger next to a shelf, and so far I have used it to charge a few different devices such as Huawei Ascend Y300 Android device (micro USB), iPhone 5 (Lightning), iPhone 4 (30-dock connector) and finally a GoPro Hero 3 action camera (micro USB). The only downside to this cable is the length. It’s just 20cm long so you are not going to be able to connect it to a wall plug down by the floor and expect your iPhone to be charging on your nightstand. 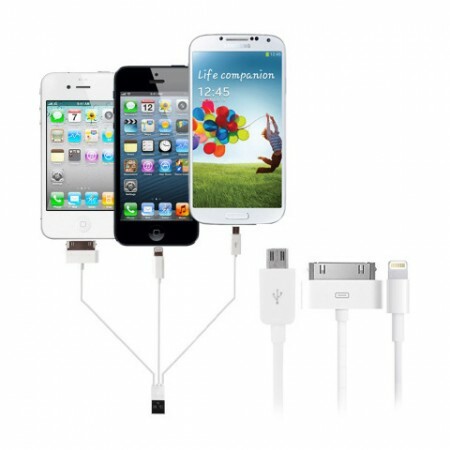 Unless of course you want to also attach a USB extender cable, then it would work. That’s why I have it next to a shelf, so I can put my device on the shelf next to the charger, while charging. It’s nice just to have one place to charge the devices you just most, instead of having to rely on different cables/chargers for different devices. Considering a single 0.5 meter Apple 8-pin “Lightning” cable costs £15, this 4-in-1 cable at just £9.99 seems like a good deal to me.